Irn Bru is known as Scotland's "other national drink." But the beloved bright orange soft drink is a sugar bomb, so its makers have reformulated it to comply with a new U.K. sugar tax. Few people outside of Scotland have heard of Irn Bru (pronounced "Iron Brew"), but it's so popular at home that it's been called the country's "other national drink," after the whisky known to much of the drinking world as Scotch. Bright orange cans or bottles of Irn Bru seemed to be everywhere on a recent trip to Glasgow. What does it taste like? One website describes it as "a cross between bubble gum and cream soda." Faced with a new tax that could force them to hike prices in a competitive soda market, the maker of Irn Bru decided instead to cut the sugar in half. These days Scottish shop owners aren't surprised to see customers, and the occasional reporter, squinting at the Irn Bru labels, checking the sugar content. "You looking for the full sugar ones?" asks employee Brett Marshall at one Glasgow convenience store. During this phase-in period, he's still stocking both the new Irn Bru and the full-sugar original. He says some people are buying cases of the old stuff. "They're looking for the original Irn Bru," he says, cracking a wry grin. "Dentist's favorite! Keeps 'em in business!" "Best thing in the world for a hangover"
There has been something of a backlash. One person offered to share his recipe for the original Irn Bru; others began hoarding. Facebook groups with names like Save Real Irn Bru sprang up, and a petition to protest the sugar reduction quickly earned thousands of signatures. Nutrition experts, however, believe that as with other health-conscious changes, people will get used to the new Irn Bru. I decided to check out that theory on the streets of Glasgow. John McClymont likes the original, but hasn't noticed any great change in taste since the sugar tax was passed. "Well, it reminds me a wee bit like Mountain Dew," he says, adding, "I recommend it for a hangover. Best thing in the world for a hangover!" His 3-year-old daughter smiles up shyly as she clutches his hand. She's not allowed to drink Irn Bru — she gets orange juice instead. A bit farther down the street, Dora Connolly says she stays loyal to the original Irn Bru, though she struggles to describe what it tastes like. "I just — I don't know, it just tastes good," she says. When asked if she's tried the new, reduced-sugar Irn Bru, she grimaces. "Yeah, that doesn't taste so good," she says. "It leaves an aftertaste in your mouth." That may be due to the artificial sweeteners in the new Irn Bru recipe. But among the Glaswegians asked in this unscientific sample, Gary Bradley had the most typical response. He says he used to love Irn Bru, but as he grew older it became too much of a sugar blast. "Yeah, it's a bit too sweet for me now," he says. "Aye, I've been kind of put off it just now." "We drank it in gallons when I was young"
That's the response Naveed Sattar expects to hear more of over time. Sattar is a professor of metabolic medicine at Glasgow University, and he's quite familiar with the old Irn Bru. He grew up in a nearby village, where his family used to sell it. "We had the local shop, we sold tons of it to the local community," he says. "My father used to bring home a couple bottles every night, so we drank it in gallons when I was young." Sattar says while people may not like the idea of the government telling them how to eat, once they try a healthier version of food or drink, they soon get used to the new taste. And if a soda maker doesn't want to cut the sugar, as the maker of Irn Bru did, it can either absorb the cost of the tax or pass it on to the consumer. "The bottom line, though, is having more formulations with less sugar has got to be a positive thing," he says. "People are slowly weaned off sugary drinks. And people's taste buds will adapt, they absolutely will adapt." There are some who wonder, however, if the folks who make Irn Bru are hanging onto their old recipe — just in case the new version doesn't catch on. Classic Coke, anyone? OK. So Britain has imposed a sugar tax to try and cut the consumption of sugary drinks. But this tax is having an unexpected effect on Scotland's beloved national beverage, Irn-Bru. NPR's Peter Kenyon reports from Glasgow. 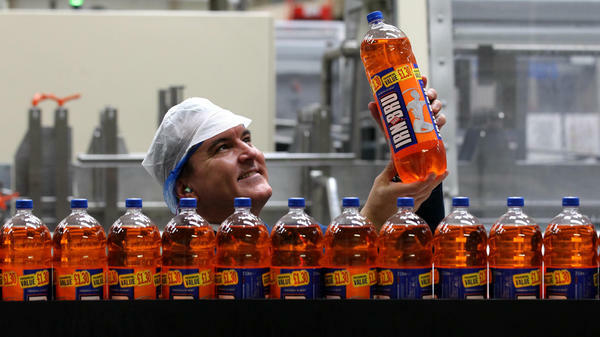 PETER KENYON, BYLINE: If you've never heard of Irn-Bru, chances are you haven't spent much time in Scotland, where it's been called the country's other national drink, after Scotch. Bright orange cans or bottles of Irn-Bru seem to be everywhere. One website describes it as tasting like a cross between bubblegum and cream soda. The new tax prompted the makers of Irn-Bru to cut the sugar in half. These days, Scottish shop owners find customers and the occasional reporter squinting at the Irn-Bru labels. BRETT MARSHALL: You looking for the full sugar ones? KENYON: Brett Marshall (ph) works at a Glasgow convenience store, and during this phase-in period, he's still stocking both the new Irn-Bru and the full-sugar original. He says he's seen people buy cases of the old stuff. MARSHALL: They are looking for the original Irn-Bru. Dentists' favorite. MARSHALL: Keeps them in business. KENYON: There has been something of a backlash. One person offered to share his recipe for the original Irn-Bru. Others began hoarding. Nutrition experts, however, believe that as with other health-conscious changes, people will get used to the new Irn-Bru. I decided to check out that theory on the streets of Glasgow. John McClymont (ph) likes the original but hasn't noticed any great change in taste since the sugar tax was passed. JOHN MCCLYMONT: Well, reminds me a wee bit like Mountain Dew. I'd recommend it for hangovers. (Laughter). Best thing in the world for a hangover. KENYON: His 3-year-old daughter smiles up shyly as she clutches his hand. He says she's not allowed to drink Irn-Bru. She gets orange juice, instead. A bit further down the street, Dora Connelly (ph) says she stays loyal to the original Irn-Bru. DORA CONNELLY: I just - I don't know. It tastes good. (Laughter). KENYON: Now they're coming out with this new formula, one with a lot less sugar in it. Have you tried that yet? CONNELLY: Yeah. That doesn't taste so good. That leaves an aftertaste on your mouth. KENYON: That may be due to the artificial sweeteners they've added, but more typical was the response of Gary Bradley (ph), who says he used to love Irn-Bru, but as he grew older, it became too much of a sugar blast. GARY BRADLEY: Yeah. It's a bit too sweet for me now. I've been kind of put off it just now. KENYON: That's the response Naveed Sattar expects to hear more of over time. Sattar is professor of metabolic medicine at Glasgow University, and he has more than a passing familiarity with the old Irn-Bru. Growing up in a nearby village, his family used to sell it. NAVEED SATTAR: We sold tons of the stuff to the local community. My father used to bring a couple bottles home every night. So we drank it in gallons when I was young. KENYON: Sattar says while people may not like the idea of the government telling them how to eat, once they try a healthier version of food or drink they like, they get used to the new taste. And if a soda maker doesn't want to cut the sugar, it can either pass on the cost of the tax or absorb it. SATTAR: Having more formulations with less sugar has got to be a positive thing. People slowly are weaned off sugary drinks, and people's taste buds will adapt. They absolutely will adapt. KENYON: There are some who wonder, however, if the makers of Irn-Bru are hanging on to their old recipe in case the new version doesn't catch on. Classic Coke, anyone? Peter Kenyon, NPR News, Glasgow. Transcript provided by NPR, Copyright NPR.